Jude, What an exciting journey this is becoming. From the time he lifted his head in the whelping box we knew he was going to be special. 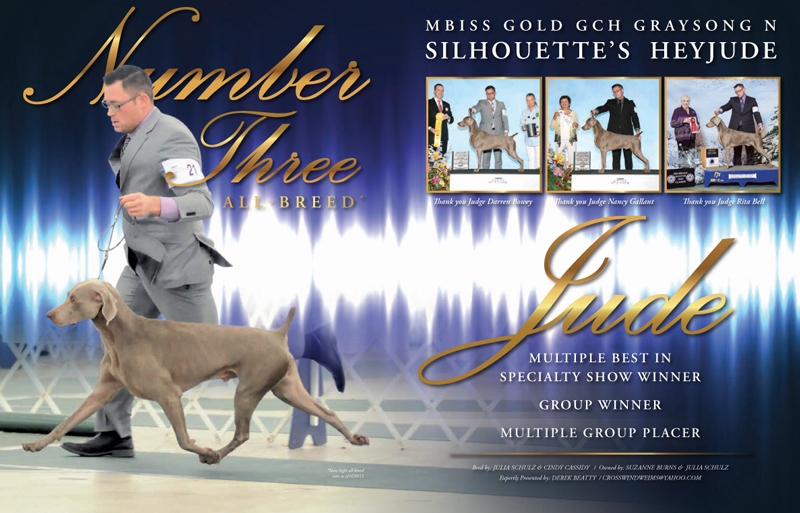 Co-bred by me (Julia) with Cindy Cassidy of Silhouette Weimaraners, Jude's pedigree is exceptional, filled with multiple National Specialty winners, BROM sires & dams, not to mention top notch hunting stock. Jude is owned by my partner Suzanne Burns of Charlotte, NC, co-owned by me and is expertly handled by Derek Beatty. Jude finished easily by 10 months of age. 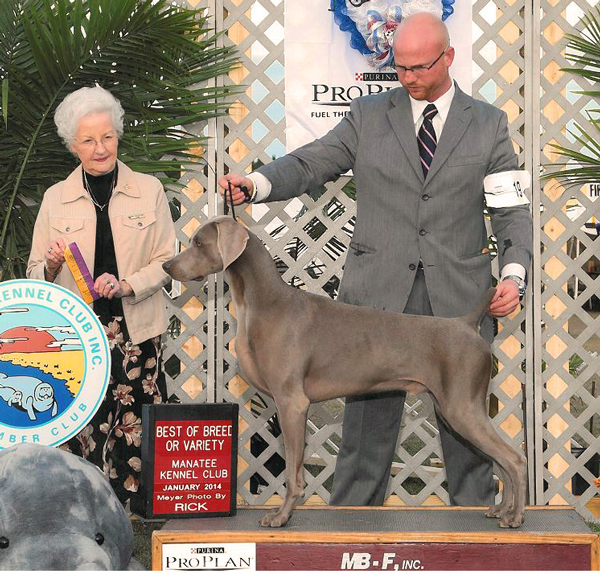 At 16 months he earned multiple Best of Breed wins, a Grand Champion title, a Best in Specialty Show, and an Award of Excellence at the Eukanuba National Championship. 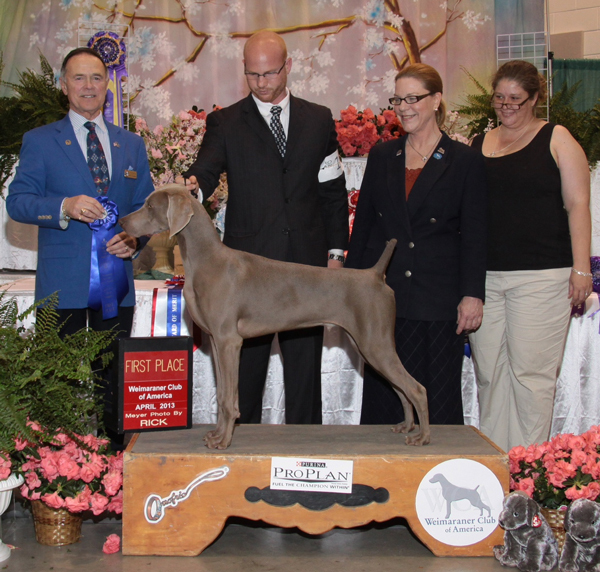 By the time he was 17 months old he had competed at Westminster, was awarded his first Group Placement and earned a spot as a top 10 show dog (all systems). 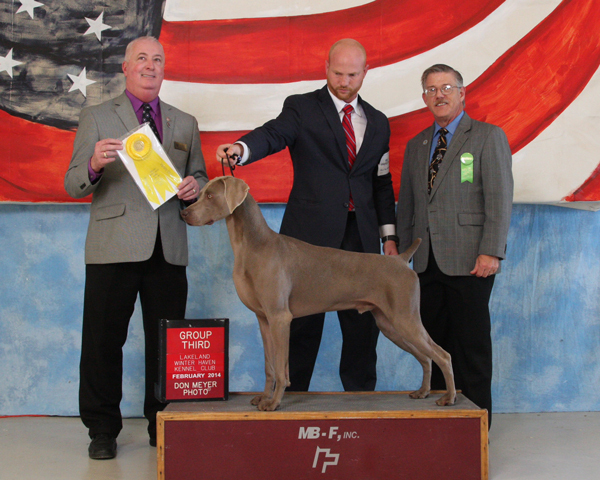 Jude is now enjoying his second year as a top 5 Weimaraner both Breed & All Breed & is currently the #1 GCH Weimaraner in the Country. Watch for his pups to hit the ring this Fall/Winter 2015/2016. 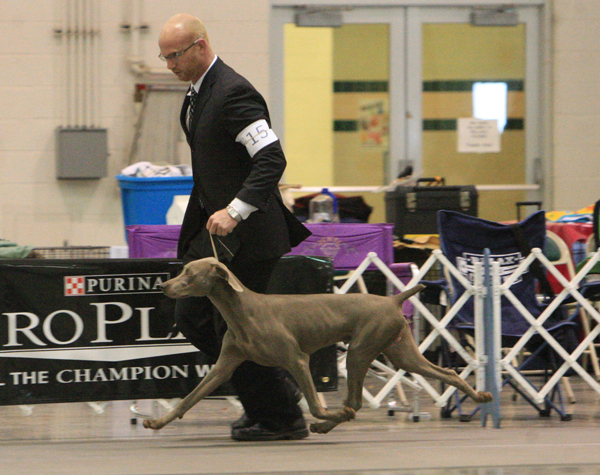 Winning the (6-9 month) puppy class at the WCA National Specialty in Perry, GA Thank you to Judge Carl Liepmann. Thank you to Judge Paula Hartinger and his first handler Jamie Cute.